In 1968 Rolling Stone writer Larry Sepulvedo discovered an exceptional blues guitarist playing the Texan circuit. "If you can imagine a hundred and thirty pound cross-eyed albino with long fleecy hair playing some of the gutsiest fluid blues guitar you have ever heard, then enter Johnny Winter". To mark the release of Winter's final album Step Back here exclusively for Gigwise he remembers the late guitarist. "As a kid in 1960 I attended many musical 'package' shows at Houston’s 10,000 capacity Sam Houston Coliseum. I believe it was 1962 that Johnny Winter had a number one hit with 'Eternally' on Houston’s Top 40 record charts when I first saw him on a package show. He came across as a star to this 12 year old. Those package shows would have up 10­/12 artists and each artist sang 3­/4 songs. 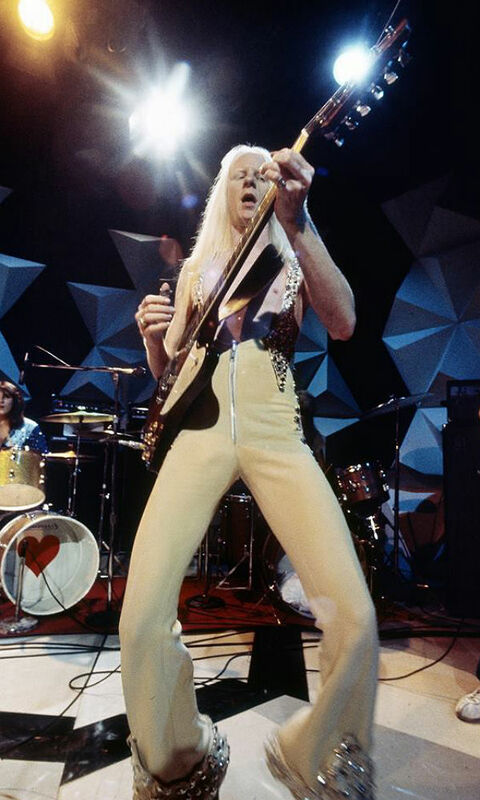 Johnny Winter’s stage presence was unique with his albino pompadour and all­ black outfit. Like most artists at the time Winter was a “one hit wonder” and a couple years later he was back playing clubs. The next time I saw him was at at a small busy Houston night club on South Main Blvd near the Houston Medical Center. Johnny and his brother Edgar Winter were performing as The Golden Fleece. The club presented the group as a circus act with the band facing the street performing behind a plate glass window flanked by two go­go girls in cages. People drove by and gawked. The next time Johnny hit my radar was early 1967 during Houston’s budding psychedelic era at David Ackles’ Love Street Light Circus & Feel Good Machine in the downtown warehouse district. Despite being open for barely three years the club hosted a 'who's who' of Texas psych: the Red Krayola, Roky Erickson's Thirteenth Floor Elevators, Bubble Puppy, Shiva's Headband, Fever Tree, Billy Gibbons's pre ­ZZ Top band The Moving Sidewalks, and American Blues featuring his future bandmates Dusty Hill and Frank Beard. Appropriately enough, it was also the site of ZZ Top's first shows. I remembered scratching my head watching Winter play straight blues with his new shoulder length hair. It was a bit of a disconnect in many ways from my early impressions of him and his music seemed generic blues compared with the other “psychedelic” bands. In 1968, I attended, along with seminal blues photographer Burton Wilson, a Muddy Waters performance at The Vulcan Gas Company in Austin, Texas where Johnny famously first met Waters and performed as his opening act. Although no match for Muddy Waters at this time, Johnny Winter was noticeably more confident and charismatic than at his Love Street performances. My strongest recollection from the evening was Johnny excitedly running around the foot of the stage taking photo snapshots of Muddy Waters and his band. A testament to his admiration. That was the beginning of the Johnny Winter buzz in Austin where, in short order, he was playing to packed houses at The Vulcan. It was also where he recorded The Progressive Blues Experiment that was released by Liberty/Imperial Records in the United States just prior to his first Columbia release. In 1967/­68 I created 3 issues of a rock magazine called Mother Magazine; most noted for it’s coverage of The Thirteenth Floor Elevators and The Red Krayola. (All issues available at the Briscoe Center, University of Texas Austin, Tx.) Mother Magazine was my calling card for meeting Jann Wenner, editor of Rolling Stone magazine. I lived in San Francisco for several months in 1968 arriving with a married couple who had ties to Chet Helms’ Avalon Ballroom, the hippie venue counterpart to Bill Graham’s Fillmore Auditorium. Helm’s was an expatriate Texan and The Avalon was a weigh station for Texas musicians fleeing anti­hippie sentiment in Texas. Janis Joplin’s first stop in San Francisco was The Avalon. My friends and I originally landed in at Minor Wilson, Burton Wilson’s son, and his wife’s apartment in San Francisco. The first weekend we were there we found ourselves backstage at the Avalon where Doug Sahm was playing. His band had also backed blues singer Tracy Nelson earlier in the evening. It was that night my friend mentioned that people needed to know how big the Texas influence was in San Francisco. Having sent Rolling Stone magazine editor Jann Wenner copies of Mother Magazine months before I called Jann Wenner the next day and arranged a meeting. I rode the bus to the San Francisco warehouse district. Rolling Stone was not a national publication at that time. My own awareness of RS was through Crawdaddy magazine and I had picked up a copy of RS at downtown newsstand in Houston as it was selected distributed throughout the United States. The Rolling Stone facility was about 1,000 square feet/0.093 square metres. Jann Wenner’s office was a piece of plywood with no door separating him from a large open area. A phone, a typewriter, and a desk were his office. A small group of longhaired artists were busy laying out the magazine when I arrived. Jann Wenner and I were both 19 years old. After a short tour of the main room we returned to his office and he forthrightly asked me “Do you want to write something?” I explained my Texas music idea. He liked it. Told me to write a Texas article but not to focus on Janis Joplin and The Steve Miller Band (Boz Scaggs was in the band at the time) since Rolling Stone readers “know all about that”. Excited, I left. A month later I returned to Texas and wrote my article three months after that. Because Johnny Winter had become the most exciting “undiscovered” music act in Texas I made him the center piece for my coverage of the Texas music scene. I sent a photo to accompany the article that came from a photo shoot a friend of mine had done at his parents house. I got a call from John Burks at Rolling Stone. Burks has just been hired as the managing editor of RS and had previously worked at Newsweek magazine. I remember thinking “Managing editor? Rolling Stone didn’t even have a receptionist just months earlier." John Burks fleshed out my piece with quotes from Boz Scaggs and some of his own observations. I was surprised when the article came out as a cover story with Doug Sahm and his then young son, Shawn, on the cover with Johnny Winter’s photo as the centre spread. The response was immediate and Steve Paul who managed The Scene, a popular New York night club, came to Houston and brought Winter back to New York. It wasn’t long before Winter was signed to Columbia Records for $600,000 for what was then the largest record deal ever offered a recorded artist. The rest is history, as they say. I got $30 for writing the article. The pull quote often gleamed from my article.. “At 16, [Mike] Bloomfield called him the best white blues guitarist he ever heard”. was a fabrication on my own imagination. I had never met Mike Bloomfield and only knew that Johnny Winter had traveled previously to Chicago and performed solo at Bloomfield’s blues club, The Fickle Pickle. After Johnny’s first Columbia album was released I remember seeing a Columbia poster in a club advertising the album and laughing because that quote was the only ad copy that appeared on the poster. Oddly, Mike Bloomfield later took ownership of the quote in an interview. A reminder to not believe everything you read! Shortly thereafter, I wrote a more comprehensive piece on Johnny for The Houston Post daily newspaper and interviewed Edgar Winter. Edgar was still playing cover material as the house band at a downtown Houston club, The Cellar. Edgar had short hair and was dumbfounded by Johnny’s overnight rise to fame. A year or so later, 1970 I believe, my photographer friend introduced me to Johnny Winter at a crowded backstage at Liberty Hall in Houston after his first album came out. During this time Johnny was “flying high” wearing a top hat, a cape, and platform shoes and didn’t seem to understand the purpose of our introduction. For the next 30+ years I had no association with Johnny Winter except for the occasional inquiry from a journalist inquiring about my Rolling Stone piece. Then early this year, March 2014, I got a call from independent filmmaker Greg Olliver, who directed the Johnny Winter documentary, “Down and Dirty”. Greg had invited me, by way of a defunct email address, to the premiere of the film March, 2014 at the South by Southwest, SXSW, event in Austin, Texas. Fortunately, he tracked down my phone number and I made the screening. The film was great beyond my expectations and, sure enough, Johnny holds up a copy of the Rolling Stone issue and enthusiastically thanks me in the film. Very nice. Johnny Winter was rushed to the screening from an interview on the Jimmy Kimmel show which was broadcast from Austin that week. During the Q&A following the screening Greg Olliver “surprises” Johnny by introducing me to him. Johnny’s reaction was pretty stone face but the “thanks” from the documentary was more than sufficient. After the film Johnny was interviewed by the Austin Chronicle, the Austin daily newspaper. Johnny’s responses were relatively flatline there, as well. Afterward the interview group dispersed for the evening I went to the bathroom where dozens of people were coming and going and I passed Johnny as he was coming out. His eyesight has never been good so I didn’t expect any acknowledgement but waiting for him at the entrance to the bathroom when was a valet with a wheelchair who then wheeled him away into the late night downtown Austin SXSW frenzy. My last image of Johnny Winter. Four months later Johnny Winter and a lifetime of his music were laid to rest." Larry Sepulvado's latest album Cajun Cats, Creole Dogs, produced by Randy Thomas is out now and is available at larrysepulvado.com. He is currently working on his new album featuring The Jordanaires, who also backed Elvis Presley and Patsy Cline.